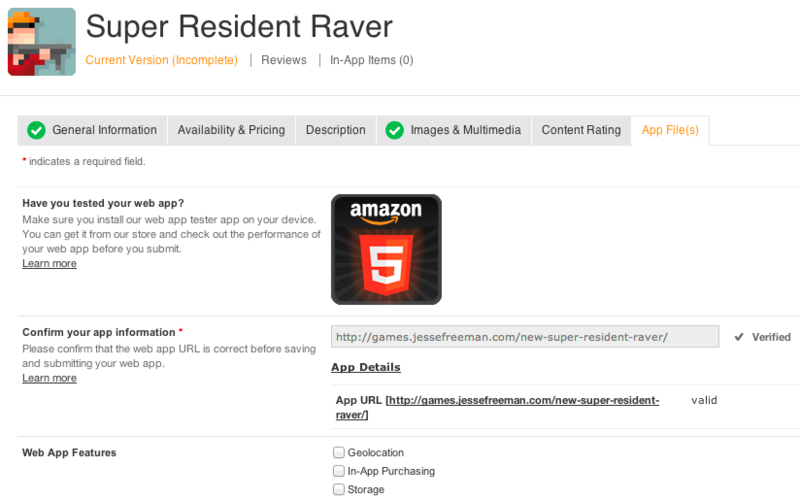 We are excited to announce that developers can publish their web apps to the Amazon Appstore without a manifest. As we continue to streamline the web app submission process our goal is to make submitting hosted web apps just as easy as submitting Android ones. Now all you need to do is supply your hosted web app’s url, instead of uploading an APK, and the rest of the process is exactly how you would expect. Fill in the app’s description, upload screenshots and define your app’s permissions which allow you to quickly publish web content to the Amazon Appstore. Let’s take a look at how this works. Our web app submission process revolves around being able to take any online website and by submitting its URL it will be published like a native app to the Amazon Appstore. For customers who have websites that support responsive design, work well on mobile, and are looking for a way to distribute their site next to native apps, this is the best solution out there for getting hosted content in the Amazon Appstore. Additionally, they can monetize their website by setting a base list price or by using Amazon’s In-App Purchasing APIs. If this is your first time submitting a web app, you simply provide a url where you would normally upload a native APK. Let’s take a look at how you can get your own web app ready for submission in four easy steps. You can now validate your web app’s URL right from the developer portal. Just keep in mind that users will need to have an Internet connection to access your site once it’s submitted. Once your URL has has been verified, you can select your app’s permission. Simply check off the options that apply to your app. Then you can define on which devices this web app can be published. While the Kindle Fire HD and HDX devices offer the best performance for web apps, make sure you test your web app on older devices to ensure the performance is ideal for your users. Intensive web games and anything using WebGL should be distributed on Kindle Fire HD and above. One other thing to keep in mind is that while you can install web apps in the Amazon Appstore on any Android device that has the store installed, it will default to the native WebView on that device. This means you will not have access to the optimized Amazon WebView and will see a drop in performance. Make sure to test out your URL in the web app Tester and select Android Web View to see what it will run like on native Android devices. Finally, the last thing you need to do is check off Distribution Rights. This ensures that you own the domain and the rights to publish the app. We will do our own verification to make sure you are in fact the owner of this domain and are not trying to publish another site to the store. As you can see, the process of submitting a web app to the Amazon Appstore couldn’t be easier. Now that the entire process is done through the developer portal it should take you only a few minutes to expand your web app’s user base by making it available to millions of Amazon Appstore customers in nearly 200 countries. Better yet, you now have the ability to charge for your web app or add in-app purchases to create new opportunities to monetize your online content on mobile devices.